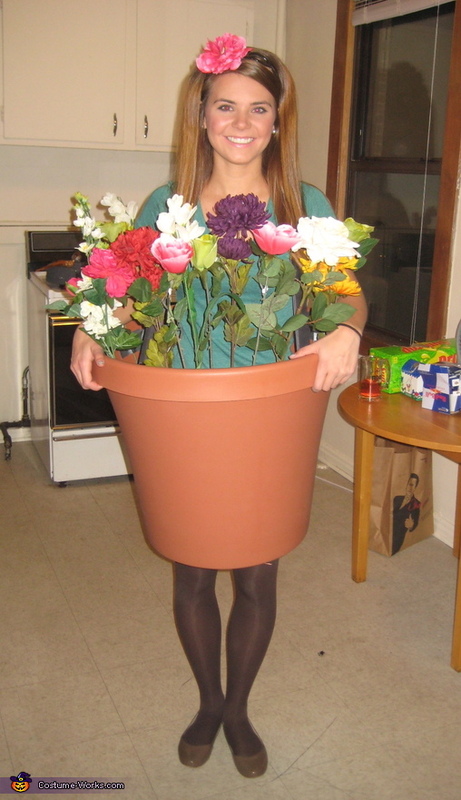 My friends and I decided to be "lawn ornaments" for Halloween, and I was a flower pot. I purchased a large plastic pot from Bachman's Floral and cut out the bottom. I used duct tape to attach a pair of my dad's old suspenders so I could wear the pot over my shoulders. I used a bunch of fake flowers that I had found for cheap at a craft store and also duct taped them around the inside of the pot. I hot glued a flower to a headband, and wore a green t-shirt, brown shorts, tights and flats I had found at Target. In total, I spent about $50 on all the materials and spent about a half hour assembling the costume. It was a huge hit!! Were you not able to sit down the whole night though?